Sorry for the picture displayed in black and white, it added little more challanges for you to spot the differences in this setup. 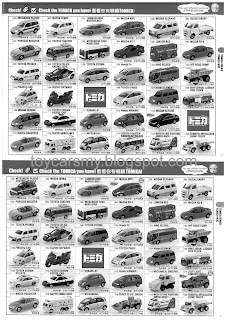 The upper portion of picture is Tomica 2007-2008 catalog and the bottom one is 2006-2007. There are few cars already replaced by new models in latest line-up, example new Pajero replaced old Pajero. If you like earlier Toyota Estima, you getter get it before it replace with the new face lift.